A beach is closed anytime there is a known sewage or chemical spill impacting ocean waters. Water contact may cause someone to become ill. When a beach is closed, the Department of Public Health advises beach users to avoid all contact with ocean water in the closure area and where closure signs are posted. A rain advisory is issued when there is significant rainfall that may cause bacteria levels in ocean waters to increase. Bacteria levels can increase significantly during and after rainstorms, as contaminants within the runoff enters the ocean. Bacteria levels may remain elevated up to 3 days depending upon the intensity of the rain and the volume of runoff. Elevated bacteria levels in ocean water may cause illness, especially in children and the elderly. The Department of Public Health recommends that beach users avoid contact with ocean water for a period of 3 days after significant rainfall, especially near flowing storm drains, creeks and rivers. Use the map below to obtain the current water quality status of your favorite beach location. Use your mouse wheel to zoom into a particular location. Click on the marker to identify the sampling location. This map is updated as conditions change. Laboratory results from three local agencies are displayed on the map. The Los Angeles County Department of Public Health (DPH) Environmental Health Recreational Waters Program, collects ocean water samples from the mainland, once a week throughout the year. DPH collects an additional five samples from Avalon on Santa Catalina Island beginning in April through October. The Los Angeles County Sanitation Districts (SD) collects ocean water samples at selected sites on the mainland, once each week throughout the year. The Beach Cities of Redondo Beach, Manhattan Beach and Hermosa Beach, Palos Verdes Estates and Rancho Palos Verdes (BC) jointly collect water samples within their cities, once a week throughout the year. 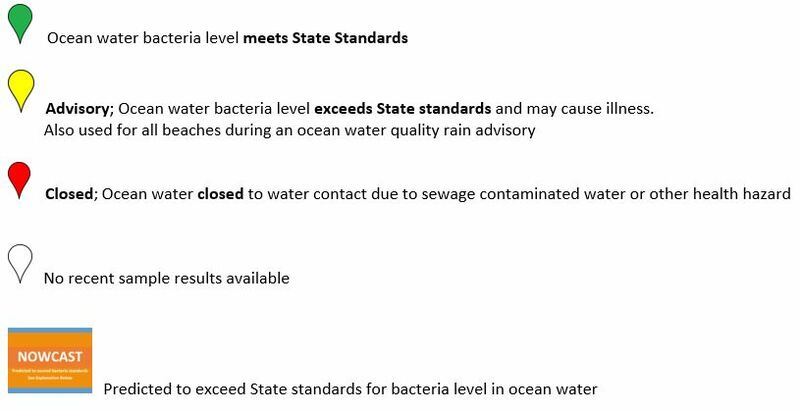 DPH, SD, and BC also resample sites that have exceeded State Standards for bacteria in ocean water. The City of Los Angeles, Environmental Monitoring Division, LA Sanitation (HYP) collects water samples from various sites, one to five times per week, all year round. LA City also collects samples at some DPH sites as required by their State NPDES permit. The public is notified when a site has exceeded State Standards for bacteria in ocean water on this website, by telephone hotline, and by signs posted at the impacted beaches. A beach closure is declared when a sewage spill has impacted ocean waters or when a significant potential health hazard has occurred or is suspected to have occurred. Water contact during a beach closure may cause illness especially in children, the elderly and susceptible people. Swimmers should avoid water contact at the posted areas of the beach until the hazardous condition has ended. An ocean water quality rain advisory is declared when there is significant rainfall that may cause run-off from inland to flow to the ocean. Contamination from run-off can cause increased bacterial levels in ocean water especially near storm drains, creeks, and other waterways. Water contact during a rain advisory may cause illness especially in children, the elderly and susceptible people. Bacteria levels may take 72 hours or more to return to normal after heavy rainfall. At all times, beach users are cautioned to avoid water contact near flowing creeks and storm drains. Los Angeles County is participating in a NowCast project in collaboration with Heal the Bay and Stanford University and University of California Los Angeles. The NowCast is a computer-based model that uses environmental data and previous test results to predict daily bacteriological water quality, much like a daily weather forecast. The project is operating at select beaches within Southern California, including beaches in Los Angeles County. The NowCast will be updated daily, April through October. For more information on the NowCast project, visit Heal the Bay website. This project has been funded wholly or in part by the State Water Resources Control Board and the United States Environmental Protection Agency under Clean Water Act's Beaches Environmental Assessment and Coastal Health Program. The contents of this document do not necessarily reflect the views and policies of the United States Environmental Protection Agency or the State Water Resources Control Board, nor does the United States Environmental Protection Agency or the State Water Resources Control Board endorse trade names or recommend the use of commercial products mentioned in this document.